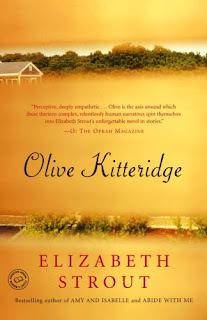 Olive Kitteridge is Elizabeth Strout 's third novel and was the 2009 Pulitzer Prize winner in the fiction category. While I don't normally hunt down and read every award-winning novel, Olive Kitteridge piqued my curiosity. Olive Kitteridge is quite the character of a woman living in small-town Crosby, Maine. A retired schoolteacher, Olive is well-known by the townspeople and has developed a reputation for being bold and strong-headed with a domineering presence. Each chapter in the novel is comprised of short stories or narratives that in one way or another involve Olive; whether it be someone telling of how they were influenced by Olive or whether she is playing an active role in that particular chapter. Most of the stories are tragic, sad, and very depressing, so if you're looking for a fun, happy, and uplifting book, it's most likely Olive Kitteridge won't fulfill that mood. Granted the stories are realistic and we all endure the fates of the characters at some point ourselves, but the novel bunches together every possible misfortune that could potentially happen to someone or a group of people. As we read through Olive Kitteridge , we witness Olive's character changing and developing throughout the years based on life events that take place. I can positively say that Olive Kitteridge provides us with further reminders and insights about cherishing the people we love, as the novel drives home that life is short more often than not. After reading Olive Kitteridge , I feel more positive and happier despite the book's dark, sad, and depressing mood. While I wouldn't consider Olive Kitteridge a must-read, I can understand why it was chosen for the Pulitzer award. Elizabeth Strout 's preceding novels are Amy and Isabelle (1998) and Abide With Me (2006).